JANUARY 2016 R ETAI LOBSE RVE R.COM 9 In the early years, under Cranston's guidance, Thermador became known as a manufacturer of electric items, most notably portable and built-in heaters. Some memorable products from this time included Skyscraper, an Art Deco line of space heaters, as well as air coolers for vehicles that pre-dated car air conditioning – very collectable items today. In the 1930s, the company's passion for innovation and high-end performance accelerated when it began manufacturing electric appliances – rapidly sparking life into the heart of the home, the kitchen. From introducing the first built-in wall oven and cooktop over 50 years ago to changing the shape of gas cooking with the patented Star ® Burner, Thermador continues to break the boundaries of convention and performance. 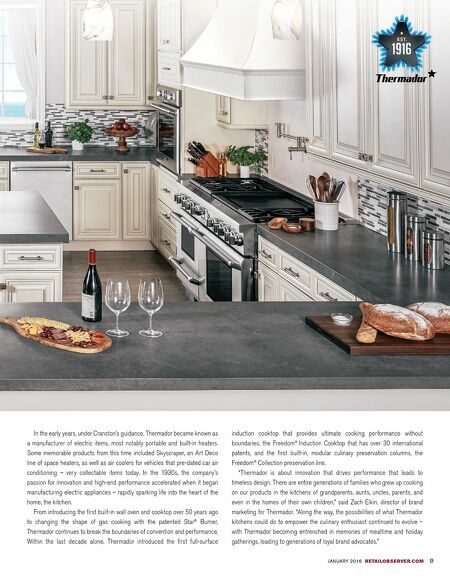 Within the last decade alone, Thermador introduced the first full-surface induction cooktop that provides ultimate cooking performance without boundaries, the Freedom ® Induction Cooktop that has over 30 international patents, and the first built-in, modular culinary preservation columns, the Freedom ® Collection preservation line. 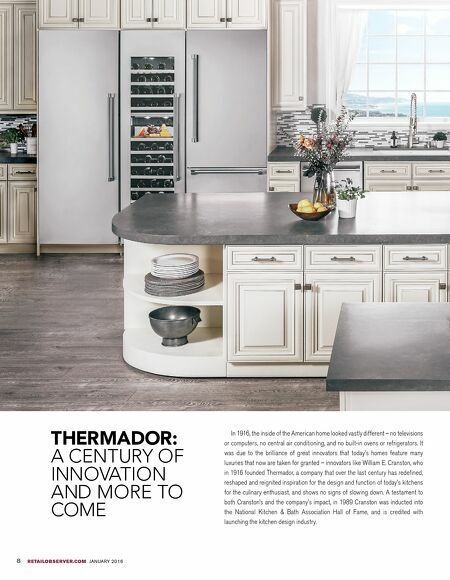 "Thermador is about innovation that drives performance that leads to timeless design. There are entire generations of families who grew up cooking on our products in the kitchens of grandparents, aunts, uncles, parents, and even in the homes of their own children," said Zach Elkin, director of brand marketing for Thermador. "Along the way, the possibilities of what Thermador kitchens could do to empower the culinary enthusiast continued to evolve – with Thermador becoming entrenched in memories of mealtime and holiday gatherings, leading to generations of loyal brand advocates."